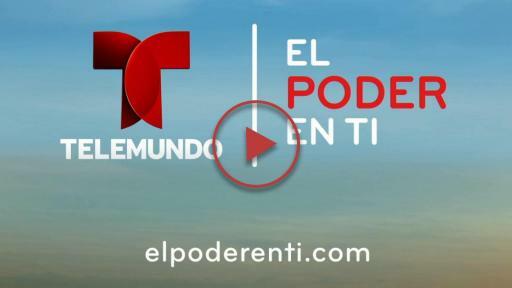 NBCUniversal Telemundo Enterprises today announced the launch of “El Poder En Ti,” the company’s robust community initiative aimed at empowering viewers to take action for a better life in areas of key importance to U.S. Hispanics: education (Tu Educación), health (Tu Salud), finance (Tu Dinero) and civic engagement (#YoDecido). Cesar Conde, Chairman of NBCUniversal International Group and NBCUniversal Telemundo Enterprises, together with key partners and Telemundo talent, will unveil the new campaign at a special star-studded cocktail reception in Miami, Florida. The multi-platform initiative, “El Poder En Ti,” focuses on the power of self-conviction, empowerment and knowledge, supported by a specialized website, digital tools and resources. Life-changing and inspirational stories are brought to life by a series of public service announcements starring various Telemundo talent, including international Spanish-language television icon, Don Francisco as the narrative voice of the campaign. The PSA’s will air across the Telemundo network, its stations and NBC UNIVERSO, as well as other NBC cable properties. In addition, informational segments will be integrated across Telemundo’s news and entertainment programming on popular network shows including Un Nuevo Día, Titulares y Más, Noticiero Telemundo, Enfoque, Al Rojo Vivo and Suelta La Sopa. Collectively, these programs reach more than 11 million viewers on an average week, according to Nielsen. These segments will also be leveraged via Telemundo’s social media platforms. Through ‘El Poder En Ti,’ we aim to highlight that it doesn’t take a fictional super hero to make great things happen – it’s about the power within all of us,” said Conde. “We have a tremendous responsibility to our community and look forward to helping empower Latinos to maximize their personal and professional potential as an important driver of U.S. economic, political and cultural growth for decades to come. Prominent Telemundo talent will appear in the PSAs, and will also serve as champions and personal advocates for their issues. They include: host of “Enfoque” and “Noticiero Telemundo” co-anchor José Díaz-Balart; “Noticiero Telemundo’s” Vanessa Hauc; NBC UNIVERSO’S Yarel Ramos; and co-host of “Un Nuevo Día,” Diego Schoening, who will focus on Tu Educación. Concentrating on Tu Salud are: “Noticiero Telemundo” co-anchor and “Al Rojo Vivo” host María Celeste Arrarás on heart health; variety host Raúl González on the topic of obesity; co-host of “Un Nuevo Día” and breast cancer survivor Adamari López on cancer; “Titulares y Más” co-host Edgar López on diabetes; “Caso Cerrado” host and breast cancer survivor Dra. Ana María Polo on cancer; and NBC Deportes’ Guad Venegas on diet and fitness. NBC Deportes’ Leti Coo and “Titulares y Más” co-host Karim Mendiburu will promote general health and wellness. Felicidad Aveleyra of “Noticiero fin de Semana,” news anchor of “Un Nuevo Día” Edgardo Del Villar and co-host of “Un Nuevo Día” Rashel Díaz will also focus on the financial issues related to Tu Dinero. The company-wide effort will incorporate a series of community partners and programs including: the American Cancer Society, the American Diabetes Association, the American Heart Association, ASPIRA, the Council for Economic Education, Cuban American National Council, the Emma Bowen Foundation, Hispanic Federation, the Hispanic Women’s Corporation, the Idea Center at Miami Dade College, LULAC, Mi Familia Vota, the National Council of La Raza, Parent Toolkit, Smithsonian Latino Center, Society of Hispanic Professional Engineers, the Susan G. Komen, the United States Hispanic Leadership Institute and Voto Latino. Events are set to roll out with Susan G. Komen and an opportunity for breast cancer survivors to share their stories of strength later this month. In addition, and in collaboration with Latino Magazine, there will be an El Poder En Ti Magazine Guide that will be distributed to national Hispanic organizations and through Telemundo owned stations. Elpoderenti.com/tueducacion – focusing on families with school-aged children with an emphasis on closing the Latino student achievement gap, especially in the areas of STEAM (Science, Technology, Engineering, Arts and Entertainment, and Math), and will highlight college preparation, career paths and job opportunities. Collaborators will include the Emma Bowen Foundation, the Idea Center at Miami Dade College, the Hispanic Women’s Corporation and the Society of Hispanic Professional Engineers. Additional community and content partners include LULAC, the NBC Parent Toolkit, the Smithsonian Latino Center and the United States Hispanic Leadership Institute (USHLI). Champions: José Díaz-Balart, Vanessa Hauc, Diego Schoening and Yarel Ramos. Elpoderenti.com/tusalud– focusing on the habits of healthy living and disease-specific prevention (heart disease, cancer, obesity and diabetes), and including weekly healthy recipes. The initiative will also be supported by Telemundo owned stations during local health fairs. Current community and content partners include: the American Cancer Society, the American Diabetes Association, the American Heart Association, the National Hispanic Medical Association, the NBC Parent Toolkit and Susan G. Komen. Champions: María Celeste Arrarás (heart), Leti Coo (general health and wellness), Raúl González (obesity), Adamari López (cancer); Edgar López (diabetes); Karim Mendiburu (general health and wellness) and Dra. Ana María Polo (cancer). Elpoderenti.com/tudinero – focusing on financial literacy, zeroing in on savings, building credit, debt management, setting financial goals, home ownership, avoiding fraud and financial preparation for college. ASPIRA, CNC, and Hispanic Federation will serve as national partners, in addition to the Council for Economic Education and CNBC. Champions: Felicidad Aveleyra, Edgardo Del Villar and Rashel Díaz. Elpoderenti.com/yodecido – Telemundo Network’s #YODECIDO one-of-a-kind comprehensive and multi-platform effort that seeks to inform, empower and engage Hispanic voters in 2016 including voter registration drives hosted by Telemundo-owned stations located in 15 markets in partnership with local community-based not-for-profit organizations including affiliates of Hispanic Federation, League of United Latin American Citizens (LULAC), Mi Familia Vota, the National Council of La Raza (NCLR), United States Hispanic Leadership Institute (USHLI) and Voto Latino, among others. As part of an ongoing effort between NCLR’s #LatinosVote campaign and Telemundo’s #YoDecido, the network’s news coverage and voter registration platform, the two groups will also produce a PSA encouraging viewers to register to vote. Brand concept, design and PSAs, created by Miami-based firm Republica, will be unveiled at the exclusive launch event. Viewers can also follow the campaign’s activities on social media via the El Poder En Ti Facebook page and #ElPoderEnTi hashtag. Additional complementary community events related to the pillars of “El Poder En Ti” will be rolled out in key markets. Source: Nielsen, L+SD, P2+ (000) avg weekly reach based on 1 minute qualifier, 4/18/16-5/15/16. NBCUniversal Telemundo Enterprises encompasses TELEMUNDO, a Spanish-language television network reaching 94% of Hispanic TV households and featuring original scripted and non-scripted productions, theatrical motion pictures, specials, news and first-class sports events; Telemundo Studios, the leading producer of original Spanish-language primetime content in the U.S.; the Telemundo Station Group, reaching U.S. Hispanic viewers in 210 markets, through its 17 owned stations and 54 broadcast affiliates in the US and Puerto Rico; NBC UNIVERSO, a modern general entertainment cable channel for Latinos, offering a thrilling mix of exclusive premium sports, signature series, blockbuster movies, music, must-see live events and strategic acquisitions, on TV, online and mobile devices; Telemundo International, the second largest distributor of Spanish-language content in the world, reaching more than 120 countries in over 40 languages; and its Digital Media unit, which creates and distributes original content across digital and emerging platforms including mobile devices, apps, www.telemundo.com and www.nbcuniverso.com, and operates Fluency Productions, the company’s multi-format, multi-platform production studio. NBCUniversal Telemundo Enterprises is a division of NBCUniversal, one of the world's leading media and entertainment companies. NBCUniversal is a subsidiary of Comcast Corporation.